YouTube is taking steps to give creators more opportunities to monetize their content on the platform by bringing channel memberships to more channels and launching partnerships related to direct merchandise sales. In a keynote address delivered at VidCon, YouTube Chief Product Officer Neal Mohan discussed several new features that will help creators reel in more money outside of ad revenue. Memberships, which were first launched as sponsorships last year, allow fans to pay $4.99 per month in exchange for perks from their favorite channels. Perks could include exclusive video content, like live streams, or specific shout-outs from the channels’ creators. Members will also be able to participate in exclusive member posts in the Community tab and get unique emojis and badges. YouTube has rolled out memberships to a few select channels, and some of the creators who have used the feature have found it to be a significant source of revenue. Comedian Mike Falzone, whose channel has over 170,000 subscribers, started trying the feature out in January of this year. He has since tripled the money he makes from YouTube, Mohan said. 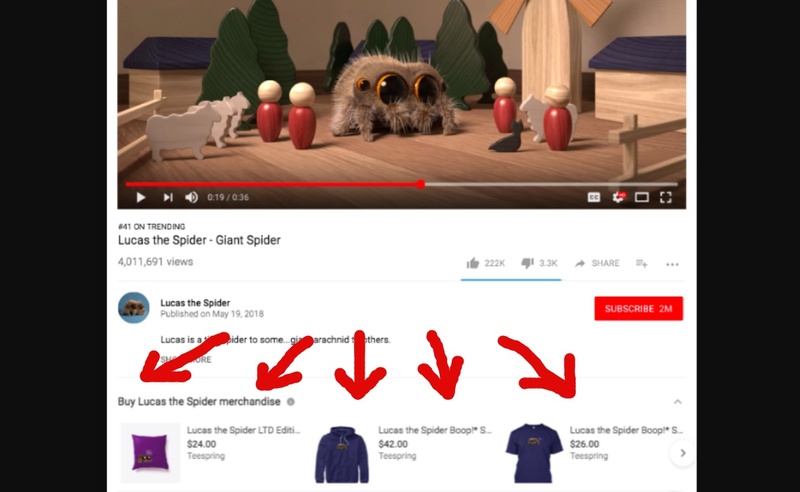 As for merchandise, YouTube has partnered with Teespring so creators can easily sell customized clothing, phone cases, and more directly from their channels. For instance, Lucas the Spider, created by Joshua Slice, now comes in the form of a plushie that sells for $20 a pop. Mohan said that YouTube’s merch platform will now be launched for all channels with at least 10,000 subscribers. These tools, combined with the new Premieres feature Mohan announced during his address, will be helpful for YouTubers who don’t want to rely solely on ad revenue. Already, things are starting to look up for a large portion of the video site’s user base. According to Mohan, the number of creators who are earning six figures per year is up by 40%.